Was This Victim of a Police Shooting Dangerous, or Just Sick? What the cops saw made all the difference. I spent July 4 at a social-justice retreat in rural Washington State, driving up into the mountains with a group of colleagues through spectacularly picturesque small towns bright with fluttering red, white, and blue banners. “There’s a wonderful general store here,” one of my friends told me as we pulled in for gas along the way. “You’ll love the place and its genuine old-fashioned charm.” I like old-fashioned as much as the next, so while the rest of the company peeled off to get pizza, I puttered my way across the road and pushed open the creaky wood-frame door to the friendly sound of jangling sleigh bells hung from the knob. “Yer looking at it,” she snarled without moving. Flushed with humiliation and feeling accused somehow, I scuttled sideways toward the exit. Just then, one of my friends walked into the store. “Hello, mister,” piped up the little girl cheerfully. Then another of the party came in. “How can I help you, sir?” asked the woman behind the counter. As my friends and the cashier engaged in a somewhat giddily suggestive discussion of various sausages, I slipped out quickly and retreated to the car. It’s hard to figure out exactly what accounts for the difference in our experience. I’m an old, gray black woman; my friends were younger white men. I felt it had to do with race, but it could have been age, or gender, or something random. It wasn’t like they were flying the Confederate flag. There’s just no way to know, we told ourselves. We moved on to other things. Wending our way along the mountain roads, we traveled through terrain not so different from that of Pasco, just on the other side of the Cascades. Pasco was the scene of a police shooting early this year that has left Washington State bitterly divided. Last February, Antonio Zambrano-Montes, a migrant farmworker from Mexico who’d apparently taken an ample dose of amphetamines, went on a rock-throwing spree in downtown Pasco during rush hour. Cellphone videos taken by bystanders reveal him in a state of considerable incoherence and distress: weaving off balance, running in circles, flinging rocks and gravel at cars, passersby, police. The images show the police first trying to tase him, then shooting at him. Zambrano-Montes runs across the street to the front of a busy supermarket, three officers in pursuit. The police shoot again, this time a larger volley. He falls to the sidewalk, and they circle his body for a few moments before handcuffing his limp arms behind his back. On July 1, the last of a series of documents was released in connection with a much-delayed follow-up report on the shooting. Included were eight videos, each taken from a slightly different angle, all available for public viewing on YouTube; from no perspective does it appear that anyone deserved to die. Zambrano-Montes was guilty of obstreperous (if fairly ordinary) disorderly conduct. But what’s most astonishing about the encounter—which took four minutes from beginning to end—was the utter lack of police discipline: a Wild West rampage on a public street during rush hour. Seventeen bullets were fired in all. 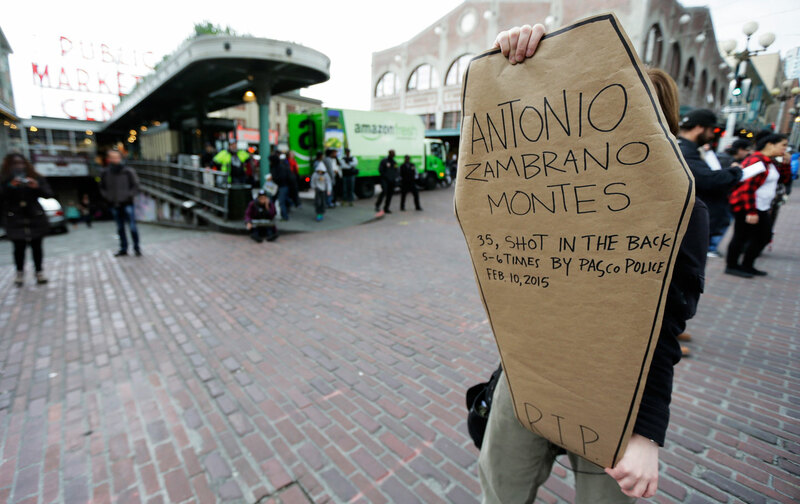 As many as seven entered Zambrano-Montes’s body. Six more were retrieved from the walls of the supermarket, a gas station, and a vending machine. Four were never found. It’s hard to figure out what accounts for such differences in perspective. But as long as we live in a culture with such aggressively policed boundaries of social division—whether age, gender, race, accent, or class—our individual experiences at the general store of our humanity will always be at odds. What manifestation has just come lurching through the opened door: a lady or a tiger? Is there really just no way to know?